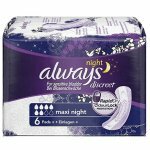 Always Infinity is a breakthrough in monthly protection. 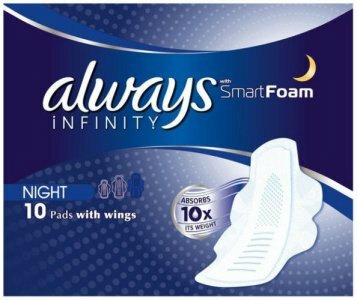 Unlike regular pads that contain mostly fluff, Always Infinity is the first pad made from Infinicel, a revolutionary liquid that forms the pad's unique foam core. 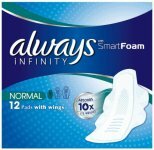 Always Infinity can absorb up to 10x its weight, and twice as much as you may need, yet you barely feel it. It is so thin and flexible that it actually moulds to your body (similar to memory foam). It’s like a second skin so you might even forget you’re wearing it, and the top sheet is really soft and comfortable to wear. If irritation develops discontinue use. Consult your physician if irritation persists.